Last year’s “Fast Five” was quite surprising in many ways. The intense action was over-the-top fun, the Brazil location was a nice change and Dwayne Johnson’s sweaty forehead awesome to behold. The biggest surprise was that the “Fast and Furious” had become a bona fide franchise and that it made it to number five. Without any vested loyalty or recollection of the previous films, I found “Five” a thoroughly entertaining and rewarding action flick, albeit a silly and unbelievable one on all levels. The sixth installment is accelerating off that movie’s box office momentum and delivers the best action movie of the year thus far. Director Justin Lin is back behind the wheel, along with his backseat driver, screenwriter Chris Morgan, both of whom have been steering this franchise one way or another since the unsuccessful third movie “Tokyo Drift”.They must’ve had a clean record though, because Universal gave them a pass and had the two helm every movie since. The numberless and article free fourth, 2009’s “Fast and Furious”, supposedly got things back on track, but when “Five” came along and blew away any moderate expectations from both critics and moviegoers, it became the first time (at least that I can recall) ever that a franchise was reinvigorated after three sequels. 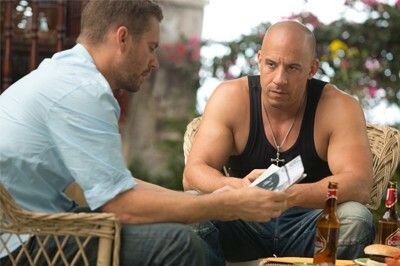 “F&F6”, or, as the on-screen title reads “Furious 6”, opens with our two lead outlaws, Brian (Paul Walker) and Dom (Vin Diesel), lying low in Spain, zipping around the Canary Islands in their fast cars, relaxing with their respective love interests, respectively, baby momma Mia (Jordana Brewster) and Elena (Elsa Pataky, aka, Mrs. Chris Hemsworth), on the beautiful coast of Spain. They’re both agreeing (or trying to convince each other) that this is now the life for them, but – something – is missing. Yeah, we know what that is – fast cars and adrenaline. But, in case we forgot, Lin provides an opening credit montage with scenes from the first five movies. Whew! Okay, now it all comes back! But hold on a minute, to show us how awesome their women are, Morgan has them kiss their men goodbye and withdraw to the sidelines as Dom and Brian furiously peel away into the movie’s action. We’ll see them again, but until then, Morgan replaces them with more strong female characters – one is Dom’s former squeeze, Letty (Michelle Rodriguez), who (in case you left during last year’s end credits) is apparently is still alive! The other is Riley (Gina Carano, “Haywire”), the new no-nonsense partner of DSS Agent Luke Cobbs (Dwayne Johnson), the guy responsible for dropping the Letty bomb on Dom and Brian. Cobbs needs the Team Fast and Furious to take down Owen Shaw (Luke Evans), a former Special Services soldier, who recently took out a Russian military convoy with his own team. When Cobbs informs Dom and his crew that the resurrected Letty (currently suffering a convenient bout of amnesia) is running with Shaw, the rest of his superhero crew is assembled! Roll call: comedy relief (huh?) Roman (Tyrese Gibson), tech guy Tej (Chris ‘Ludacris’ Bridges), and lovebirds Han (Sung Kang) and Gisele (Gal Gadot). 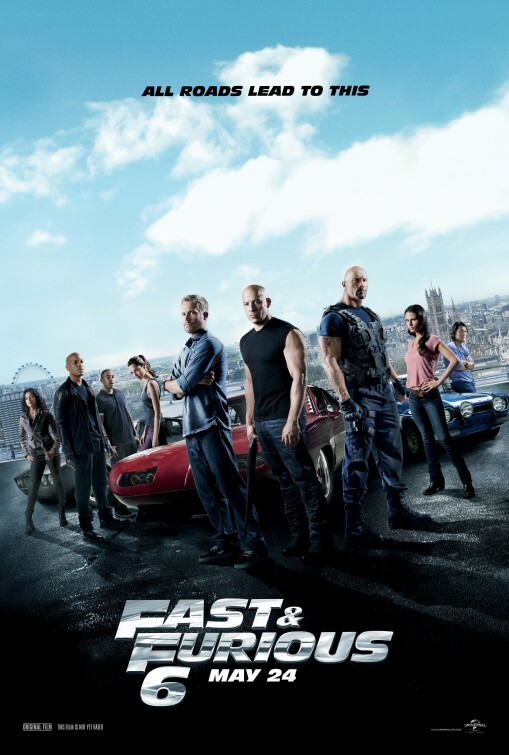 Working with Cobbs and Riley, the gang track down Shaw’s next move and determine what McGuffin (something called a Nightshade) he’s after, which inevitably brings them to Letty and whether or not she will return to Fast and Furious family. Let’s just get this out-of-the-way – these movies are ridiculous, unbelievable and entertaining. No one watching them should roll their eyes or blurt out, “Oh, come on!”, if so, they should just give up and leave. These are movies with broad-stroked characters immersed in soap opera storylines, surrounded by an amazing amount of beefcake and cheesecake and bombastic collateral damage. It is what it is and the fact that this is number six is proof that there is an audience for this kind of movie. After taking in all the bad dialogue about family from the last movie and being subjected to cheesy jokes, for some reason I didn’t find it as annoying here. Maybe because I’ve come to expect it and these characters have gotten to the point where they feel like something out of an extreme Manga cartoon with spinning wheels, big-mouthed laughter and insane action theatrics. So yeah, I can pick this sequel apart for its leaden script that includes exhausting exposition, a tacked-on flashback scene and a stretched-out cast of characters. There are so many characters here – on both the good and the bad side – that it feels like an Avengers movie, albeit with blue color characters straight from the street, the night club or Xsport Fitness. The script in a movie like this should live up to its title and while it doesn’t feel like it drags – well, there is that sequence where Brian goes back to the States, gets himself imprisoned just so he can get some information from a criminal) – thanks to a charismatic cast and director Lin’s impressive mastery of fast-moving people and vehicles. The automotive mania here is, of course, all over the place with a variety of new vehicles and locations for them to crash and collide in. There’s an insane chase scene in London where the FF crew first come into contact with Shaw and his gang of Eastern European baddies. Shaw and his gal pal Vegh (Clara Paget) zip around in this souped-up go-cart and his goons also have these handy disc devices that attach to vehicles while in motion, allowing them to take control and mess with the driver. Later in the movie, our heroes are dwarfed by a giant tank and a massive military aircraft, that only serve to give us bigger and better action scenes. All the driving and crashing is fine, but I prefer the physical action “Furious 6” offers here. We get not one, but two, crazy girlfights with Rodriguez vs. Carano that are impressively choreographed. These two knock each other into walls and throw each other down stairs. Just like bringing Johnson into the franchise last year was an adrenalized boost, adding former MMA fighter Carano was a smart move. There’s also a formidable martial arts presence on Shaw’s team as we see when Indonesian Joe Taslim (“The Raid: Redemption”) takes out Han and Roman. Near the end of the movie, we also see Hobbs going up against a hulking muscle-headed goon (Kim Kold, who towers over The Rock, making their fight look like The Hulk vs. The Thing), eventually needed assistance from Dom. This kind of physical action is always where the movies in this franchise has entertained viewers (we wind up feeling like ringside), since the vehicles can only do so much. Admittedly, I hopped in the passenger seat last year with “Fast Five”, which turned out to be an absolute blast. It just happened and hit me the right way. “Furious 6” may not feel as new or as manically bugnuts, but it is nevertheless relentless and silly and includes one surprise well into the movie (that I didn’t see coming) as well as an end credit surprise that’ll have everyone looking forward to number seven. Right now, this is the best action movie of the year, which is exactly what it set out to do.